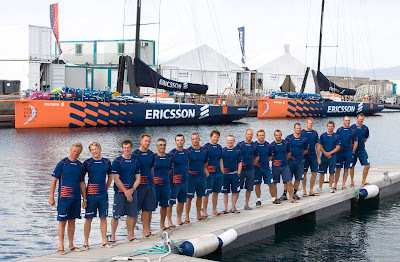 The two crews of Ericsson Racing Team arrived in Alicante, Spain, on Friday. Ericsson 3, skippered by Sweden’s Anders Lewander, arrived mid-afternoon. Ericsson 4, skippered by Brazil’s Torben Grael, arrived a few hours later. The journey from the team’s training base in Lanzarote, Canary Islands, took about four days. Brad Jackson, watch captain and helmsman aboard Ericsson 4, was happy to arrive with boat and crew in good shape. The trip was mostly in light air, although they did experience a bit of rough, upwind work today which made for a bumpy ride. Jackson also expressed enthusiasm with what he saw of the facilities in Alicante. “First impressions are it looks like a big place, it looks like shore facilities are very good and the teams’ bases are good. It looks like a great setup,” he said.